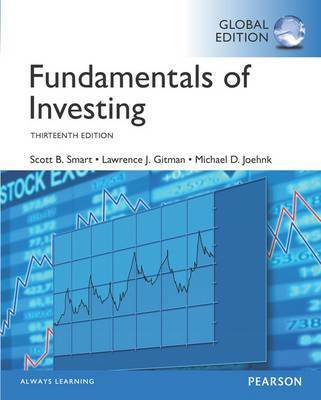 Author(s) Smart, Scott, B.; Gitman, Lawrence, J.; Joehnk, Michael, D.
For undergraduate courses in Investments. Fundamentals of Investing helps students make informed investment decisions by providing a solid foundation of core concepts and tools. Smart/Gitman/Joehnk use practical, hands-on applications to introduce the topics and techniques used by both personal investors and money managers. The authors integrate a consistent framework based on learning goals to keep students focused in each chapter. Students leave the course with the necessary information for developing, implementing, and monitoring a successful investment program. The 13th Edition uses a conversational tone to make the foreign language, concepts, and strategies of investing accessible to a student audience. With the help of examples throughout, students learn to make informed decisions in order to achieve investment goals. The book focuses on both individual securities and portfolios, teaching students to consider the risk and return of different types of investments and how to use this knowledge to develop, implement, and monitor goals.